This might come as a surprise for those who know that I’ve been going three to five days a week for the past five years. But I have to force myself every morning. Most days it’s only knowing that I have a good book to read on my Kindle while I’m walking on the treadmill that gets me there. And if the book doesn’t pass the “Kindle test” – keeping me distracted enough that I can almost forget I’m exercising – I delete it and cue up the next book. Fitness Junkie definitely passed the Kindle test. And I enjoyed the irony of reading it while on the treadmill. The second novel by authors Lucy Sykes and Jo Piazza, the book centers around Janey Sweet, CEO of couture wedding dress company B, whose dresses only go up to size four. When Janey makes headlines stuffing her face at a fashion show, her partner and best friend, Beau, demands she take three months off and lose thirty pounds – or else. Immediately, this sends Janey into the insane world of New York City fitness, where she meets a shaman and begins attending the ultra-exclusive The Workout. 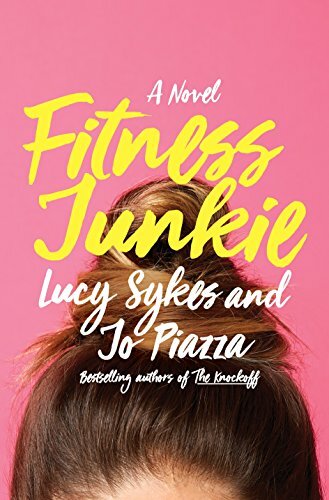 At the same time, Janey’s cousin Ivy, a former ballerina turned spin class instructor extraordinaire, is tasked by her bosses to learn more about The Workout, to whom they fear they are losing their best customers. It’s hard to say whether Fitness Junkie is standard chick lit fare or satire, as some of the most outlandish ideas – an all-clay diet, for instance – may very well be popular in certain areas of New York. Many scenes reminded me of the Bravo TV series Odd Mom Out, where protagonist Jill Weber once wondered if NYC women were so mean because so many of them were on starvation diets. Every aspect of the book is exaggerated just beyond believability, from the boot camp-like environment of Ivy’s classes to Janey’s dumpster-diving date with a hipster juice bar owner. As Janey learns more about Beau’s actions behind her back – and flashbacks reveal he’s always been more frenemy than best friend—the book becomes more episodic. Janey continues her fitness and diet antics, while the reader wants her to do everything possible to get back at Beau and regain control of her company. And while Ivy’s dilemma is interesting, she’s not the character readers will identify with. Janey is, up to a point. While this is definitely a book about the crazy fitness culture, it is also a book about privilege, and I’m not sure the authors are fully aware of that. While Janey is momentarily startled that a weeklong fitness retreat will cost fifteen thousand dollars, that doesn’t keep her from going. Not only is she not bothered by unemployment – she does own half the company – she is also an heiress to her family’s candy company, which sounds big enough to rival Snickers-manufacturer Mars. Although Ivy occasionally worries about money, none of the other women think twice about paying enormous amounts of money for classes. Even the dumpster-diver does it more for environmental reasons than monetary ones. Any reader who lives paycheck to paycheck will be so turned off by this attitude that she might miss the book’s humor entirely. This casual outlook toward money seems to stress that fitness is another area that’s reserved for the one percent, or at least the top ten. And indeed, with obesity being directly related to poverty and stress, the authors may have a point in placing their story in the richest city in the country. It just may be a point they did not intend to make. Thanks to Doubleday for the book in exchange for an honest review.